For Americans of a certain age, Saigon conjures up images of the Vietnam War with helicopters departing from rooftops as people desperately try to get out before the city and country fell to communism. Today, there are three Vietnam War era sites that are a must-see for Americans visiting Ho Chi Minh City. 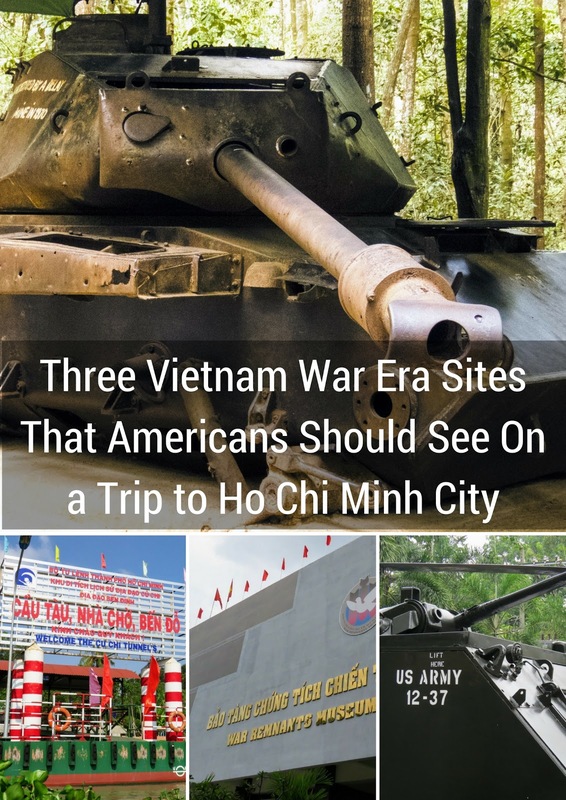 These sites are not easy but I think it's important for people (and Americans in particular) to understand the consequences of the Vietnam War. 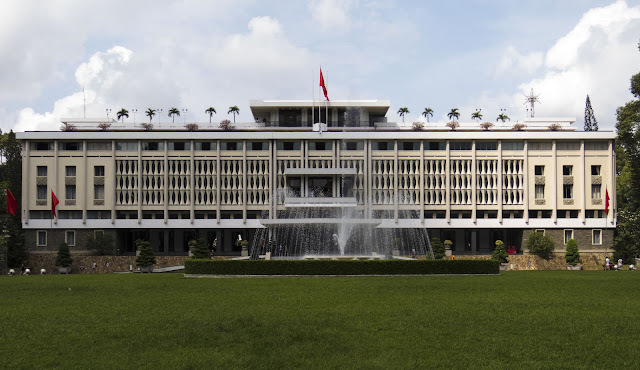 Formerly known as the Independence Palace, Vietnam's Reunification Palace in Ho Chi Minh City was where the Vietnam War ended. Helicopters departed from the rooftop as a North Vietnamese tank crashed through the gates. Even today, a helicopter sits on the roof as a reminder of this difficult bit of history. The leadership of South Vietnam lived in the palace during the Vietnam War. The basement bunker is particularly interesting. Racks of communication equipment and maps laying out key strategic positions still adorn the walls. It's like stepping back in time to 1975. The War Remnants Museum in Ho Chi Minh City was particularly emotional for me. There are some interesting examples of Vietnam War era aircraft and tanks outside. The real heart-wrenching exhibit is inside though in a display of the effects of napalm and other chemical agents used as defoliants during the war. Graphic photographs show the horrendous birth defects that the generation alive during the war and their descendants suffered and continue to suffer. The War Remnants Museum also reminds visitors that 3 million Vietnamese were killed, 2 million were injured, and an additional 300,000 people went missing during the Vietnam War. Such a tragedy. The Cu Chi Tunnels outside of Ho Chi Minh City is another important Vietnam War era site. Here you'll see the extensive Viet Cong network of tunnels through which North Vietnam waged guerrilla warfare against a theoretically stronger enemy. We visited the Cu Chi Tunnels with a Les Rives speed boat half day tour. Traveling to the Chu Chi Tunnels by boat is more expensive than other options but you avoid potential traffic jams and get there earlier so it's less crowded. Our excursion to the Cu Chi Tunnels included breakfast (fruit, snacks, drinks) and lunch plus unlimited water and soft drinks for $85 per person at the time of writing. In addition to the main tunnels where we had a chance to go inside and experience the darkness and tight space, we also saw Viet Cong hide-out holes. If the enemy was approaching, a North Vietnamese soldier could drop below ground with arms extended above his or her head and not leave a trace. We also saw examples of jungle booby traps designed to maim South Vietnamese and American soldiers. The Cu Chi Tunnels also featured lots of Vietnam War era ordnance. I can't be sure, but I hope these items were all defused. For an extra fee, you can shoot a machine gun on site. At first I thought this was rather gimicky and unnecessary. As we were walking around the Cu Chi Tunnels, it did add an air of authenticity and transport us back in time when we heard the crackle of gunfire every few minutes. The Vietnam War ended over 40 years ago. 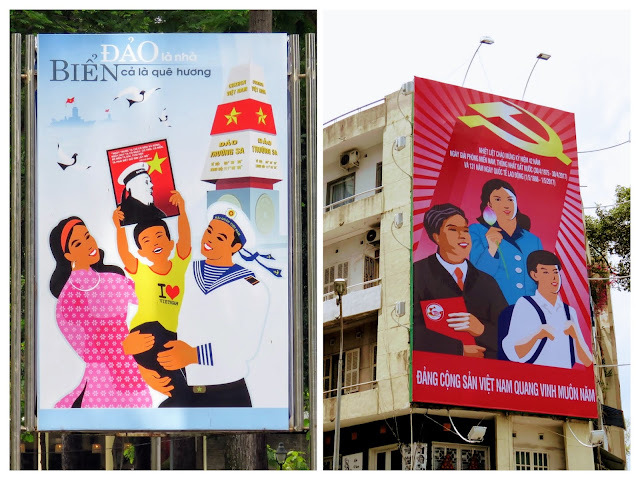 Even today, we saw that the spirit of Vietnamese nationalism lives on with signs and slogans all over Ho Chi Minh City. We visited Ho Chi Minh City on Vietnamese Reunification Day. We expected there to be major celebrations and fireworks. The festivities were definitely more low key than I thought they would be and were not widely advertised (at least not in English). We stumbled upon a bicycle race and some sort of speed parade not far from the Reunification Palace. In the end, we got the sense that the Vietnamese have moved on and that they are too busy living their lives to stop and reflect on this difficult piece of their history. Have you visited Saigon/Ho Chi Minh City? Did you see traces of the Vietnam War? What were your impressions? 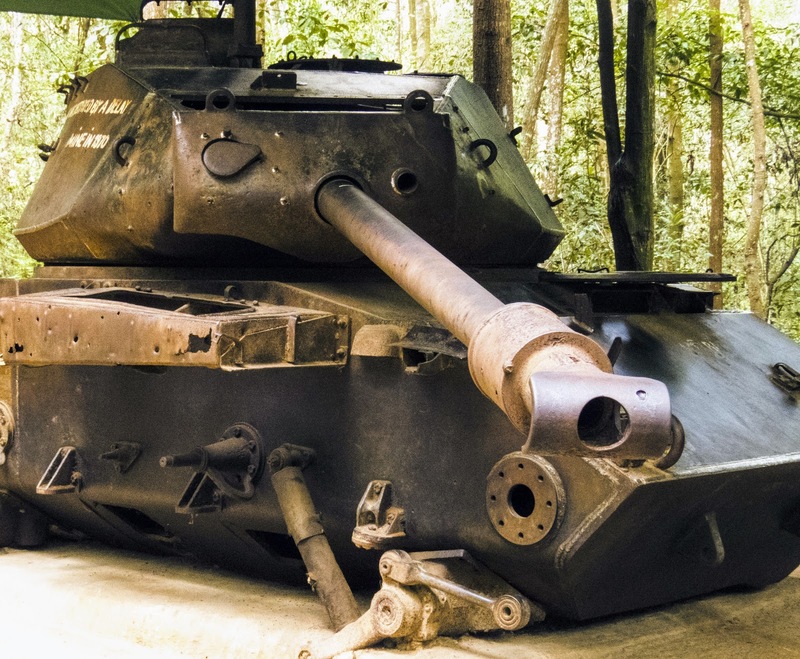 Learn about the Vietnam War era sites that Americans should visit in Ho Chi Minh City. A photo-rich post by travel blogger, Jennifer (aka Dr. J) from Sidewalk Safari.